Six top environment artists share their secrets. With the fidelity of video game CG and film effects growing by the day, the ability to create spectacular environment and landscape art has never been in higher demand. Such images can set the tone of an entire piece. Here we introduce the most creative artists in the field today so you can discover their techniques and learn how to paint landscapes as amazing as theirs. Finnian MacManus is a concept artist working in the film and game industries. "When designing landscapes I always start with the background history and culture of the area I'm creating," he tells us. "Landscapes and architecture have their own character, expressed by their patterns and shape relationships. I try to accentuate these and push them further than reality. "To create palettes, I rely heavily on reference images that are shot without filters, to get the true colour of a scene from the earth. It's then, by pushing these grounded palettes past reality, that I believe you can create a wonderful and mysterious mood. "I owe a ton of the knowledge I have now to the concept artist John Park. One of the great things he taught me and other students at Brainstorm School was to reinforce our foundational background before starting with 3D and photo texturing. I feel it's very important to have a good knowledge of perspective, design and composition before jumping into the greater challenges that this industry offers." "My work is always approached with the goal of making a spectacle," says freelance artist Oscar Gregeborn. "For me, a successful painting is not one where I receive compliments on my rendering or some other aspect. It's one where the viewer is so drawn to the painting that they feel an urge to explore every part of the world I've created. "Although I equip myself with many different tools and techniques when creating a painting, exploratory colour choices and otherworldly designs are the facets I utilise the most. "When I first started painting, my initial focus was to copy reality. But my good friend Jesper Friis taught me that by bending the rules of reality, you can achieve a far higher visual impact. Remember that the possibilities of art are limitless, so use the tools given to you to create a feast for the eyes!" As an art director and production designer at DreamWorks Animation, Maxwell Boas has to work fast. "A lot of the time I only have a few hours at my desk to execute an idea," he reveals. "So I've created a habit of being very clear with the concept before I begin to paint. I usually do quick, loose thumbnails and explore rough colour ideas before I start on a piece. There's nothing worse for me than to have invested the time and energy in a painting and not be happy with the concept, composition or lighting idea later on down the road. "I have been fortunate to have worked with the talented production designer Raymond Zibach. He has taught me to ask, 'What is the artistic statement I am trying to make?' Whether it's a bold composition, a unique colour palette or a lighting idea to help stage a character, staying true to that initial idea creates a stronger, more emotional piece of art." Freelance artist Andrey Surnov is particularly interested in developing and imagining environments for online games. "I see them as the most defining aspects of the worlds we're developing," he explains. "Landscapes are powerful storytelling tools, impacting the player with more immediacy than narration or lore, yet their potential is often overlooked or underrated. Character design is too crowded a space, because most young artists seem to gravitate towards it. "The best advice was given to me by my curator: don't compare your pieces with artworks created by more skilled artists who are working in the same style. Instead, be so unique that such comparisons are irrelevant." 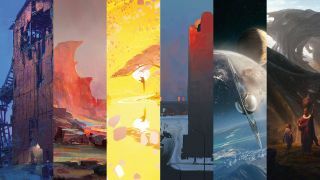 "The imagination of an artist is boundless, I'm sure we all agree," says Jessica Rossier, co-founder of visual development studio Wardenlight. "The immensity of that is something that has excited me for many years, and creating environmental design enabled me to exploit this passion beyond character design. "Each new image I invent seeks to exploit the space in the best way possible, to create ever larger and more impressive environments. "I like playing with scales of magnitude. The photobashing technique is the one I prefer. It involves working with an existing photograph and transforming its shape completely to produce an entirely different creation." For freelance matte painter and concept artist Christian Dimitrov, finding the balance between the big, epic landscape and the little stories incorporated in it is a big part of his job. "I'm still learning about how to find this balance," he tells us. "I hope I'm achieving the feeling of a different world in my works and that I can engage people with the stories the painting is telling. One of the techniques I use most often is the Quick Selection Tool with Refine Edge option in Photoshop CC. It's a wonderful tool for extracting all kinds of elements, such as clouds, buildings, trees and so on. "One of the best and most profound bits of advice I've had was from Dylan Cole: 'The hardest thing about painting is maintaining the spirit of a sketch in a final illustration.' This kind of analysis opened up my eyes and made me think about design in a new, completely different way. This is something that I continue to learn about and try to be better at."